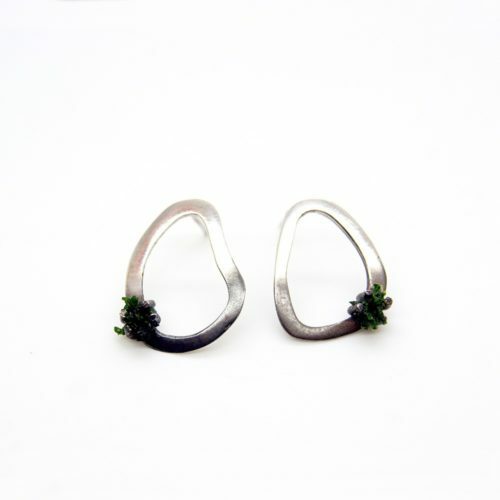 Hand made jewellery inspired by nature and made from natural, ethical materials. Simple luxury for the everyday, this ocean inspired pendant is a smooth yet eye catching accessory. A brass ‘ripple’ with a high polished silver puddle. Comes with a 300mm chain. Recycled jewellery at its finest! 100% recycled silver, brass and 18ct gold plate. The pendant is 30mm x 25mm, with a 300mm chain. Chunky silver ring (Style 3) made by electroforming, creating unpredictable clusters via electrical currents. This ring has a heavy texture on the top half of the ring. Made from solid 925 silver, 5mm at its widest point. Available in UK ring sizes M-Q (see other Untamed styles for other sizes). 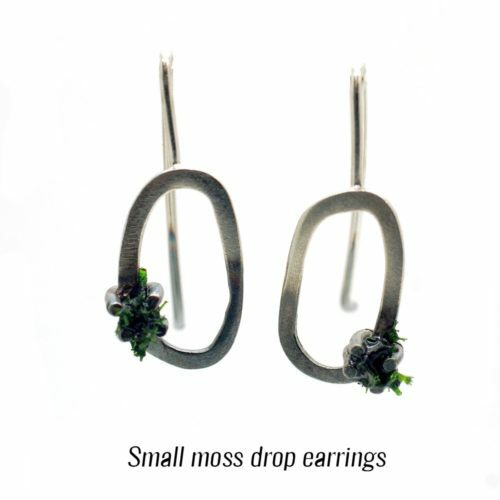 Green drop earrings in silver with preserved moss: what better way to treat the outdoorsy girl? 3 sizes available (15-28mm long). Also available in stud style. Green stone ring set in chunky silver. Organic, mythical form with a blend of stone, moss and resin. 925 silver. 23 mm x 20mm x 10mm. Handmade silver ring (Style 2) from the Untamed collection. Gnarled and bubbled silver ring with an organic form, resulting from electrical currents in the making process. Handmade in England by Libby Ward. UK ring sizes L-P.
Silver pendant necklace in real preserved moss. 45cm chain (18 inch), 1.2mm snake chain. A perfect gift for the nature loving outdoorsy girl! Unusual silver ring, this Style 1 from the Untamed collection, is made using an unpredictable process - electroforming. By changing the electrical current, further variation is introduced as metal emerges in bubbling clusters within an electrolytic bath. Made from solid 925 silver. 3mm at its widest point. UK ring sizes H-L.
Craton earrings - Lava collection: A flowing hooped earring that swoops around the earlobe. The shape mimics molten lava inside a volcano. 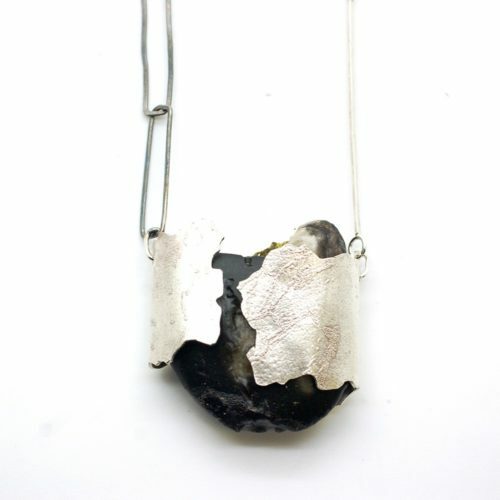 Handmade by Emma Aitchison from recycled silver or silver and 18ct gold plate. This everyday gold necklace in 18 carat is a smooth pendant, like a touchable drop of lava. Made from recycled brass and 18ct gold plate, on a gold filled chain. Inspired by nature’s soft, organic lines, this bangle is handmade from recycled brass and lacquer by Emma Aitchison in London. 3cm round profile. Please select your size, referring to the size guide. K2 is a hand carved mountain ring with mighty peaks and organic ridges, as a daily reminder of rugged mountains. Recycled silver, 18ct gold plate. An everyday gold pendant inspired by volcanoes and lava. Recycled silver and 18ct gold plate, on a gold filled chain. Magma earrings in gold - Lava collection: A unique hooped earring shaped like molten lava. 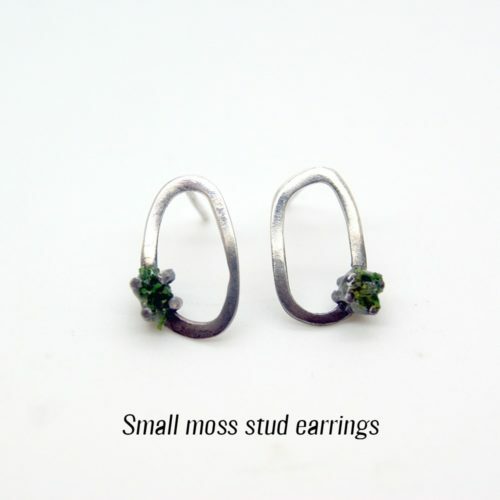 Can be worn with one or both of the hoops (one on the back of the earlobe). Recycled silver and 18ct gold plate, available in two. Hand carved stacking rings, formed of 1 silver and 2 brass rings. Inspired by the peaks of Ben Nevis, Scafell Pike and Snowdonia.